프랑스 여행은 이탈리아 여행에서 이어진 터라 딱히 미리 준비한 게 없었다. 마지막으로 들러야 할 도시가 파리라는 것 외에는 아무 것도 준비하지 않았다. 당연히 여행 루트도 전혀 생각하지 않았다. 미안하다. 프랑스. 별로 관심이 없었어. Because this travel was relayed right after travel in Italia, we didn’t prepare anything. There was nothing fixed except our last destination is Paris. 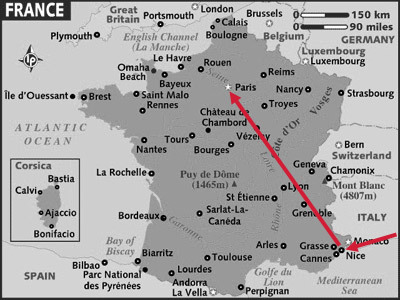 Surely, I haven’t thought about route in France. Sorry, France. I had no interest in you. 글쎄…… 과연 우리가 알고 갔을까? 운명이라고 밖에는 설명할 수 없다. So, our final route was like above. Well…… We went there with knowing something? It was just our destiny.